Preliminary information : there are two competing rules for setting up maximal cookie lifetime. The European Commission (based a.o. on a proposal by CNIL) suggests to limit lifetime to 360 days whereas Google proposes 720 days. One year vs. two years is basically what you have to chose from. In no case it should be more than that. Yet, as Miller and Skiera explained at the 2017 EMAC conference, lifetimes of up to 8000 years have been found. 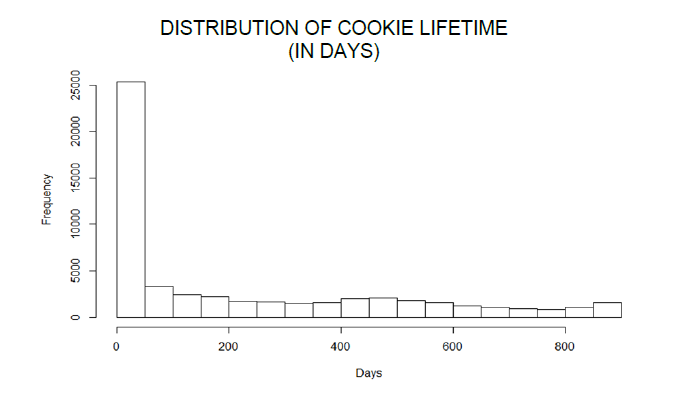 Especially interesting is the statistical distribution of cookie lifetime. Much has been said and hypothesized about cookies and in particular how some users may deleted them. Let’s first say that users’ declarations on their cookie deletion behaviors has been already put in question. It seems indeed that users’ declaration are very exaggerated. Miller and Skiera’s study sheds light once again on those behaviors and the least we can say is that they don’t reflect once again what users use to declare. With an average lifetime of a cookie of 215 days and a median of 68 days, you immediately understand there is something going on here. With such a difference between the average and the mean, you can assume the distribution is completely skewed which is indeed the case here. 20% of cookies see their value increase over time and those 20% account for 60% of the total value. 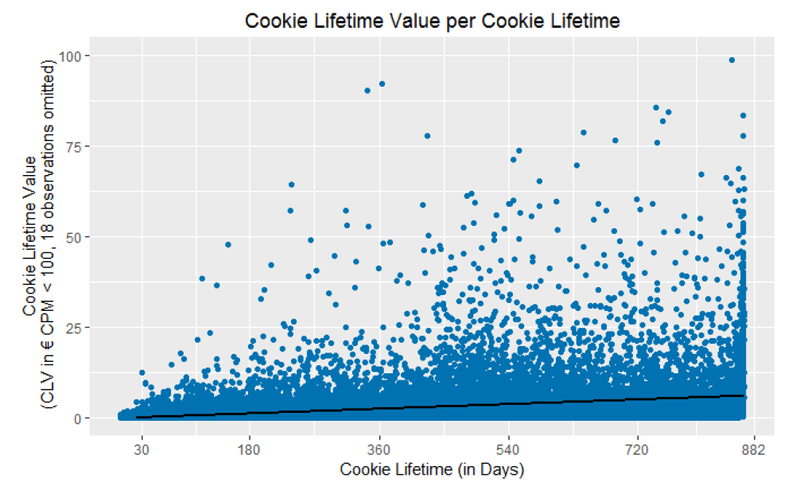 Most cookies don’t get much older than 30 days and some see their value decrease over time.